Buccleuch Mansion was built circa 1740 by Anthony White for his bride, Elizabeth Morris, the daughter of Lewis Morris, a colonial governor of New Jersey. It became known as White House Farm. Their son, Anthony Walton White, went against family tradition and sided with the revolutionaries, against the British, during the Revolutionary War. During the war, the house was occupied by the British, and still shows saber and musket marks on its floors and banisters. Following the Revolution, the house was owned by Colonel Charles Stewart. During his ownership, his home was visited by a number of prominent men, including George Washington, Alexander Hamilton, General Kosciusko, General Gates, and John Hancock. Several rooms are decorated and furnished in the Colonial and Federal period to reflect this history of the mansion. The house was bought by Colonel Joseph Warren Scott in 1821, and occupied by members of his family for the next 90 years. It was he who renamed it Buccleuch Mansion, in honor of his Scottish heritage. The home and its grounds were left by his grandson to the city of New Brunswick for use as a public park, and to honor his grandfather. Opened as a museum in 1915, its interior and furnishings are maintained by the Jersey Blue Chapter, to promote the appreciation of American history. Today, the mansion is open to the public on the last Sunday afternoon of months June through October, and can be opened for tours at other times by prior arrangement. Docents guide visitors through the museum. Anyone wishing to see the house should contact the curator at 732-745-5094. The James and Ann Whitall House, built in 1748, is located on the Delaware River in northern Gloucester County. The Whitall family lived in the home for 114 years, and it was the center of life on the 400-acre Red Bank Plantation that once occupied the site. Following the decisive 1777 Continental victory at the Battle of Red Bank, Mrs. Ann Whitall remained behind to care for the wounded in her home, which had been converted into a hospital. Wounded men from both sides of the battle were tended there. Although forced to leave their plantation during most of the military occupation, the Whitall family returned in 1778, and resumed farming. At its busiest, the plantation included orchards, livestock, a grist mill, smoke house, shad fishery and a ferry across the Delaware River. In 1872, ten years after the Whitall family vacated their home, the U.S. government purchased the Whitall House. Few changes have been made over the years to the basic structure or original decor of the home, which is open to the public for tours from spring to early fall. Many of the antiques displayed on the main floor of the home are the property of the Ann Whitall Chapter, including a magnificent grandfather clock and a chair owned originally by Ann Whitall. Members of the Red Bank Chapter maintain two rooms in the Whitall House, and some members of both chapters serve as docents. 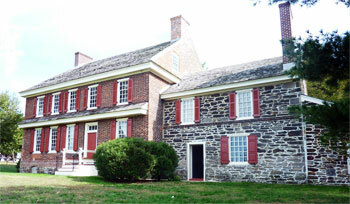 The Whitall House is located at 100 Hessian Ave., National Park, NJ 08063. The house is open for tours from April to mid-October, and for a holiday open house in December. Information is available by calling 856-853-5120. The Tamassee DAR School was established by the Daughters of the South Carolina Society in 1919, and supports children and families in crisis through residential, educational and outreach services. The school's core values of faith, hope, charity, and excellence, supported by integrity and stewardship, provide the highest quality of care. The New Jersey State Society is proud to be able to maintain the New Jersey Cottage at the Tamassee DAR School. 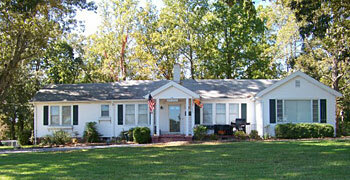 Currently the New Jersey Cottage is a staff house for the Chief Program officer and his family.